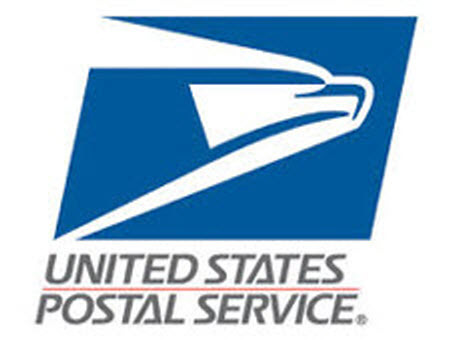 The US Postal Service (USPS) continues to gain market share from its rivals, according to the Postal Regulatory Commission (PRC), which adopted rules this month concerning the share of institutional costs that Competitive products must contribute. The current appropriate share requirement for Competitive products is 5.5 percent of institutional costs. For Fiscal Year 2019, the appropriate share is 8.8 percent. See more information and the impact of the PRC’s ruling in this story – a must-read if you missed our January 3rd story in EcommerceBytes Newsflash. In its report, the PRC included some interesting information about the market growth of USPS parcel delivery. It noted that the Postal Service and its competitors experienced steady increases in revenue over the past 5 fiscal years, indicating that growth in the market benefited all market competitors. “The Postal Service also captured market share since FY 2007, particularly in the years since FY 2011,” according to the PRC report. 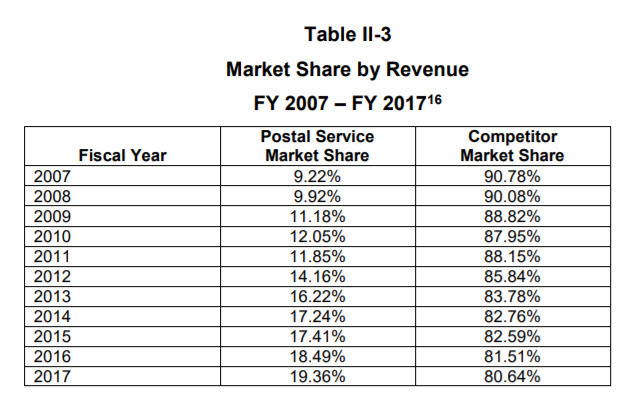 Table II-3 shows the market share by revenue for the Postal Service and competitors for FY 2007 through FY 2017.
and the Postal Service specializes in last-mile business-to-consumer delivery of lightweight parcels. “As shown in Table II-3, the Postal Service’s market share as measured by revenue was 9.22 percent in FY 2007. By FY 2017, the Postal Service’s market share as measured by revenue grew to 19.36 percent. “Although this demonstrates that there has been growth in the Postal Service’s market share as measured by revenue, the Postal Service maintains a relatively modest share of the overall market. This is especially true when one considers that the parcel delivery market has three primary competitors that make up the majority of the market: United Parcel Service, Inc. (UPS), Federal Express Corporation (FedEx), and the Postal Service. “One of the primary ways these three competitors have competed with one another for customers is through firm specialization and product differentiation. Each of these firms has developed specialties in certain types of delivery: FedEx specializes in international and express delivery; UPS specializes in business-to-business delivery; and the Postal Service specializes in last-mile business-to-consumer delivery of lightweight parcels. 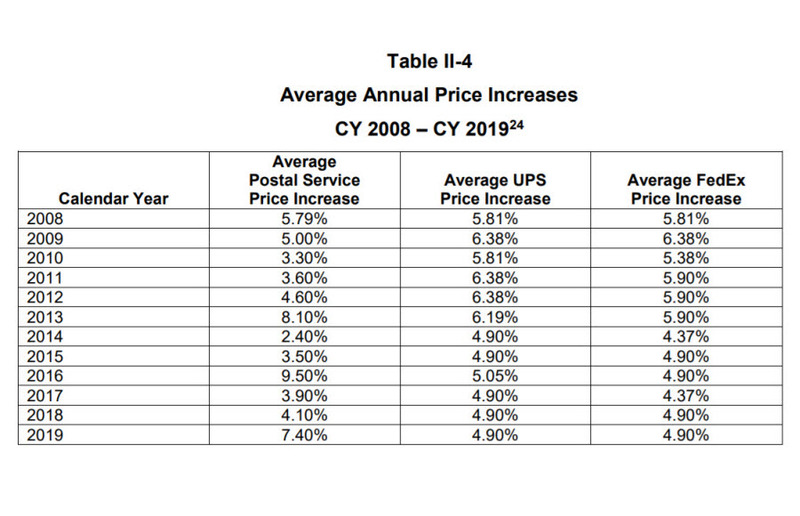 The report also included a table showing showing the average annual price increases for all three competitors from CY 2008 to CY 2019 (Calendar Year). You can find the report on this page the PRC.gov website, and the press release is found on this page. And they keep losing money and raising prices.